Aim: The aim of this study was to evaluate the fracture resistance of endodontically treated maxillary premolars with wide mesio-occluso-distal (MOD) cavities restored with either composite resin, or composite resin reinforced with different types of fibres. Materials and Methods: Fifty human maxillary premolars were selected. Five intact teeth served as positive controls. Endodontic therapy was carried out in the remaining forty-five teeth. Standardized MOD cavities were prepared in all the teeth. The teeth were restored with a nanocomposite using an incremental technique. These forty five teeth were randomly divided into three experimental groups (Group A, B and C) (n = 15). The teeth in Group A did not undergo any further procedures. The teeth in Group B and C were reinforced with composite impregnated glass fibre and polyethylene fibre, respectively. Fracture resistance was measured in Newtons (N). Results: The positive controls showed the highest mean fracture resistance (811.90 N), followed by Group B (600.49N), Group A (516.96N) and Group C (514.64N), respectively. One Way analysis of variance (ANOVA) test revealed a statistically significant difference between all the groups (P = 0.001). Post-hoc Tukey test revealed a moderately significant difference (P = 0.034) between Control and Group B, and a strongly significant difference between Control and Group A (P = 0.002), and Control and Group C (P = 0.001). Conclusions: Endodontic therapy and MOD cavity preparation significantly reduced the fracture resistance of endodontically treated maxillary premolars (P = 0.001). No statistically significant difference was found between the experimental groups (Group A, B and C) (P > 0.1). However, the fracture resistance of the composite impregnated glass fibre reinforced group was much higher than the others. Following endodontic treatment, there is a decrease in the fracture resistance of the teeth. This is also seen after the preparation of wide mesio-occluso-distal (MOD) cavities. An ideal restoration for a tooth is able to maintain the aesthetics and function, preserve the remaining tooth structure and prevent the microleakage. Indirect restorative procedures such as metallic post and core fabrication followed by full crown are customary. However, there may be cases where the tooth is still erupting, or where the tooth or root canal therapy has a questionable prognosis, or where the clinician wants to wait and evaluate the healing of a periapical lesion before proceeding with full crown restorations. To prevent the failure of root canal treatment, a simple, quick, high strength, direct and cost effective restorative procedure may be desirable. Adhesive technology is advancing by leaps and bounds every day, making it possible to create conservative and highly aesthetic restorations with direct bonding to the teeth. A significant increase in the fracture resistance of root filled teeth was observed when they were intracoronally restored with a resin composite material. , Reinforcing composites with polyethylene fibres and glass fibres has successfully provided superior results. ,, However, there are no studies comparing the two in direct composite restorations. The aim of this study was to evaluate the fracture resistance of endodontically treated maxillary premolars with wide mesio-occluso-distal (MOD) cavities restored with either composite resin, composite resin reinforced with a polyethylene fibre, or composite resin reinforced with a composite impregnated glass fibre. 50 intact human maxillary premolars, extracted for orthodontic reasons were collected. All the specimens were scaled to remove the adhering soft tissue and calculus, and were stored in physiologic saline. Teeth with caries, morphological defects or fracture lines were discarded. Five intact teeth were used as positive controls and endodontic access cavities were prepared in forty five teeth using a water cooled diamond bur (Endo Access Bur; Dentsply) with an airotor hand piece, and the pulp tissue was removed with barbed broaches. A size 15 K-file (Mani Prime Dental Pvt. Ltd.) was introduced into each canal until it could be seen at the apical foramen. The working length was then determined by subtracting 1 mm from this length. The canals were prepared with ProTaper (Dentsply Maillefer) nickel titanium (Ni-Ti) instruments using a 1:64 reduction handpiece (Anthogyr NiTi Control; Dentsply) at a speed of 300 revolutions per minute. Coronal flaring was done with the Sx file. Canals were shaped till the working length using the S1 and S2 files, and the apical third of the canal was finished using finishing file F1 and later F2. Copious irrigation using 5 ml of 5.25% sodium hypochlorite was carried out throughout the procedure. One set of ProTaper files™ was used for the five teeth. Buccolingual grooves were prepared, etched and bonded in a manner similar to Group B. Flowable composite resin with 10 mm of polyethylene fibre (Ribbond; Ribbond Inc., Seattle, WA, USA) which had been saturated with the unfilled resin (Scotch Bond Multi Purpose Plus; 3M ESPE, St. Paul, MN, USA) was added to the groove and cured from occlusal direction for 20 seconds. The exposed surface of the fibre was covered with a layer of the nanocomposite and cured for 40 seconds from the occlusal direction according to the manufacturer's instructions. All restorations were finished and polished (Shofu Dental). The teeth were then mounted in a block of cold cure acrylic measuring 2 cm in diameter, at CEJ. A layer of polyvinyl siloxane was adapted around the root surfaces to simulate the periodontal ligament. Thermocycling was carried out for 500 cycles at 5 to 55°C, 30 second dwell time and 5 second transfer time. All the specimens were stored in an incubator (iBod) at 37°C and 100% humidity for 24 hours. , The fracture resistance of the teeth was measured using a universal testing machine (LR 50K; LLOYD Instruments), under a compressive force at a strain rate of 0.5 mm/min. A 5 mm diameter round stainless steel ball was positioned parallel to the long axis of the teeth and centered over the teeth until the bar just contacted the occlusal surface of the restoration and the buccal and lingual cusps. The force needed to fracture each tooth was recorded in Newtons. ,, The study design was a three arm comparative study where the outcome variable was fracture resistance. Statistical analysis was performed using descriptive statistical methods, One Way ANOVA test and the Post-hoc Tukey test. The Statistical software namely SAS 9.2, SPSS 15.0, Stata 10.1, MedCalc 9.0.1, Systat 12.0 and R environment ver.2.11.1 were used for the analysis of the data and Microsoft word and Excel were used to generate graphs, tables etc. Highest mean fracture resistance was observed with positive control followed by Group B and group A respectively. Group C recorded the lowest mean fracture resistance. 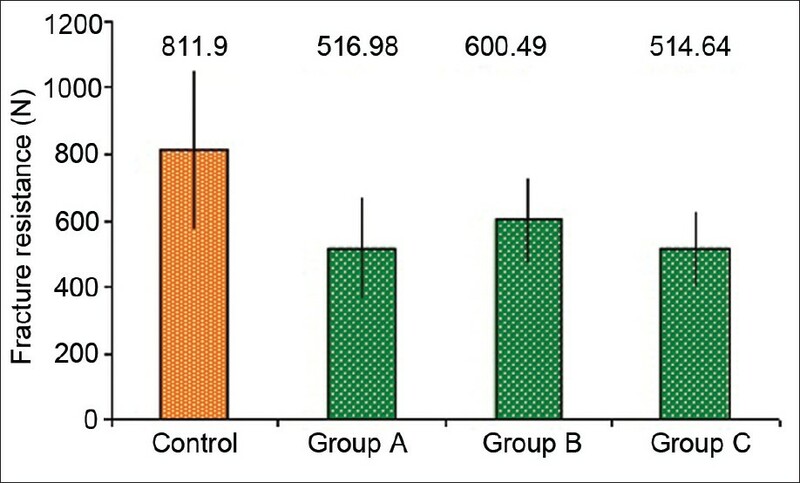 One Way ANOVA test revealed a significant difference (P = 0.001) between the groups [Table 1] [Figure 2]. On intergroup comparison, Post-hoc Tukey test revealed a moderately significant difference between Control and Group B (P = 0.034) whereas a strongly significant difference was recorded between Control and Group A (P = 0.002) and between control and group C (P = 0.001). No significant difference was recorded between any of the experimental groups (Group A, B and C) (P > 0.1) [Table 2]. This study recorded that Group B had the highest fracture resistance amongst the experimental groups. The superior performance of Group B may be because of the pre-fabricated resin impregnation of these fibres by the manufacturers. Also, glass fibres have very high tensile strength, density and percentage of elongation allowing them to withstand high stresses without fracturing. Results of this study were in agreement with the study by Kolbeck et al.,  who reported the glass fibres performed better than polyethylene fibres due to pre-impregnation with light cured composite which ensures a good bond with the composite resin. Group C also showed reasonably good fracture resistance. Polyethylene fibres have shown high fracture resistance in previous studies. , According to the manufacturer Original RibbondÔ fibres are woven using the lock-stitch leno weave which prevents slipping of fibres within resin matrix, prevents micro-cracks from propagating to form larger cracks and reinforces the restoration in multiple directions. Beli et al., found that insertion of polyethylene fibre in the occlusal third of a composite restoration increased the fracture resistance of root filled teeth compared to teeth restored with composite resin alone. However, the present study showed that insertion of polyethylene fibre did not significantly increase the fracture resistance of a root filled tooth as compared to teeth restored with composite resin alone (Group A) (P > 0.1). The LWUHMW polyethylene fibre is treated with cold gas plasma to convert the material from hydrophobic to hydrophilic. This treatment is meant to make the fibre surface more receptive to bonding with the resin however; it makes the fibre very technique sensitive. Any contamination to the fibre surface may affect its adhesive properties. Handling of the polyethylene fibres was found to be tougher in the present study. The fibres frayed on cutting, and became very stiff after the wetting procedure. An additional reason for its poor performance may be lower tensile strength, density and elongation compared to glass fibres. Though it was not among the objectives of the study it was observed that the majority of failures in the fibre reinforced groups were favourable in nature. The fracture in 80% cases occurred superior to the CEJ. This can prove immensely beneficial to clinicians as despite fracturing, the tooth remains repairable with techniques such as post and core followed by full crown. Additionally, the study done by Reeh et al.,  showed a relative loss of stiffness of 5% due to endodontic procedures and 63% in MOD cavity preparation whereas the present study found a relatively smaller decrease of 25-35% in fracture resistance of root filled teeth with MOD cavity preparation restored with nanocomposites or nanocomposites restored with different fibres. Despite this decrease in fracture resistance all the experimental groups demonstrated results much higher than the average normal biting force of human maxillary premolars (100-300N). Many differences exist between fractures occurring clinically and those induced by a machine. Forces generated intraorally during function vary in magnitude, speed of application and direction, whereas the forces applied to the teeth in this study were at a constant direction and speed and they increased continuously until fracture occurred. Further in vivo studies should be done to test the reinforcement effect of fibres in clinical situations. Root canal treatment and MOD cavity preparation significantly reduced fracture resistance of root filled maxillary premolars (P = 0.001). Even though there was no statistically significant difference between the test groups, the fracture resistance of the composite impregnated glass fibre reinforced group was much higher. 1. Summitt JB, Robbins JW, Hilton JT, Schwartz RS. Fundamentals of operative dentistry: A contemporary approach. 3 rd ed. Carol Stream, Illinois: Quintessence Publishing Co, Inc; 2006. p. 599. 2. Guzy GE, Nicholls JI. In vitro comparison of intact endodontically treated teeth with and without endo-post reinforcement. J Prosthet Dent 1979;42:39-44. 3. Trope M, Langer I, Maltz D, Tronstad L. Resistance to fracture of restored endodontically treated premolars. Endod Dent Traumatol 1986;2:35-8. 4. Monga P, Sharma V, Kumar S. Comparison of fracture resistance of endodontically treated teeth using different coronal restorative materials: An in vitro study. J Conserv Dent 2009;12:154-9. 5. Belli S, Erdemir A, Ozcopur M, Eskitascioglu G. The effect of fibre insertion on fracture resistance of root filled molar teeth with MOD preparations restored with composite. Int Endod J 2005;38:73-80. 6. Belli S, Erdemir A, Yildirim C. Reinforcement effect of polyethylene fibre in root-filled teeth: Comparison of two restoration techniques. Int Endod J 2006;39:136-42. 7. Oskoee PA, Ajami AA, Navimipour EJ, Oskoee SS, Sadjadi J. The effect of three composite fiber insertion techniques on fracture resistance of root-filled teeth. J Endod 2009;35:413-6. 8. Hegde MN, Hegde P, Bhandary S, Deepika K. An evalution of compressive strength of newer nanocomposite: An in vitro study. J Conserv Dent 2011;14:36-9. 9. Gogna R, Jagadis S, Shashikal K. A comparative in vitro study of microleakage by a radioactive isotope and compressive strength of three nanofilled composite resin restorations. J Conserv Dent 2011;14:128-31. 10. Xu HH, Schumacher GE, Eichmiller FC, Peterson RC, Antonucci JM, Mueller HJ. Continuous fibre preform reinforcement of dental resin composite restorations. Dent Mater 2003;19:523-30. 11. Ramos V Jr, Runyan DA, Christensen LC. The effect of plasma-treated polyethylene fiber on the fracture strength of polymethyl methacrylate. J Prosthet Dent 1996;76:94-6. 12. Reeh ES, Messer HH, Douglas WH. Reduction in tooth stiffness as a result of endodontic and restorative procedures. J Endod 1989;15:512- 6. 13. Hegde MN, Bhandary S. An evaluation and comparison of shear bond strength of composite resin to dentin, using newer dentin bonding agents. J Conserv Dent 2008;11:71-5. 14. Ausiello P, Apicella A, Davidson CL. Effect of adhesive layer properties on stress distribution in composite restorations: A 3D finite element analysis. Dent Mater 2002;18:295-303. 15. Mitra SB, Wu D, Holmes BN. An application of nanotechnology in advanced dental materials. J Am Dent Assoc 2003;134:1382-90. 16. Preethi GA, Kala M. Clinical evaluation of carbon fiber reinforced carbon endodontic post, glass fiber reinforced post with cast post and core: A one year comparative clinical study. J Conserv Dent 2008;11:162-7. 17. Kolbeck C, Rosentritt M, Lang R, Handel G. In vitro study of fracture strength and marginal adaptation of polyethylene-fibre-reinforced-composite versus glass-fibre-reinforced-composite fixed partial dentures. J Oral Rehabil 2002;29:668-74. 18. Vallittu PK. Flexural properties of acrylic resin polymers reinforced with unidirectional and woven glass fibers. J Prosthet Dent 1999;81:318-26. 19. Jantarat J, Palamara JE, Messer HH. An investigation of cuspal deformation and delayed recovery after occlusal loading. J Dent 2001;29:363-70.